At Future Sports Academies Singapore, tennis lessons for kids are the most important aspect of developing skills in young players who are serious about playing tennis competitively, or for children who just want to learn tennis the correct way and play for fun and health in Singapore. Building the correct fundamental movement skills are core to what we instil to the kids to develop solid foundations to play and stay in tennis for a lifetime. Future Sports Academies tennis classes for kids encourages children to be enthusiastic about playing tennis, being outdoors, and staying fit and discipline. 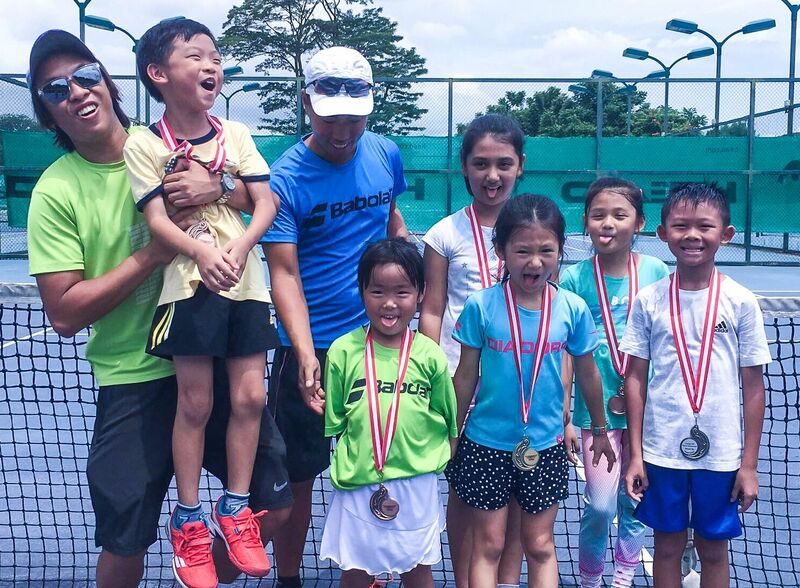 Our tennis lessons for kids in Singapore is one of our most popular, and for good reason! More and more parents in Singapore are realizing the unique advantages (ie. Life skills development) that tennis can offer their children – mental strength, honesty, discipline, self-confidence and perseverance just to name a few that schools do not teach much nowadays. These are just some important life lessons that kids can learn through tennis! Are you concerned that your child may be too attached to technology? You’re certainly not alone. What happened to the good old days when kids went outside to play? Science has proven that children who spend time outside each day demonstrate increased fitness levels, higher attention spans, stronger immune systems, heightened creativity, and even better vision. For kids, outdoor time is kind of a big deal. But of all the outdoor activities to choose from, why choose tennis? And because students learn them at a young age, they’re likely to hold on to these skills for the rest of their lives. Tennis jumpstarts children on a healthy lifestyle and then keeps them on that path for life. Future Sports Academies (FSA) sets the bar high for tennis lessons in Singapore. We are the premier tennis academy in Singapore! Our tennis coaches in Singapore are made up of professionals with years of experience playing and coaching the sport we love. 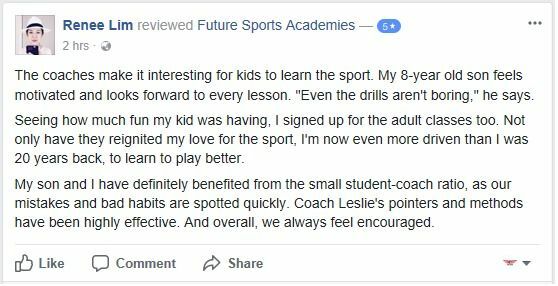 Much to our delight, parents that enrol their children in our children tennis classes in Singapore often give us feedback just like this. And best of all, our students love their tennis classes even more than their parents do. Many of our students become friends with one another. Some even decide to book personal tennis lessons with the tennis coaches at our academy or sign up for more kids group tennis classes immediately after their first class! Introduction to tennis and the basic techniques (dependant on age and speed of learning), rules and regulations for tennis. Encompass the development from the basic strokes to include more technical aspects to bring the junior game to the next level; whilst introducing concepts about match play. Focus on more advanced competitive match play concepts, using more ‘live ball’ drills. Juniors will learn about mental toughness and advance techniques to fine tune technical aspects of their game to prepare them for the elite level. The ultimate level for junior players. The training programme will focus on improving their unique strengths and minimising their weaknesses. If you’re interested in a healthy (and incredibly fun) way to help your child develop physically, mentally, and socially, look no further. Sign your child up for our Kids Tennis Lessons in Singapore and check out our Adults Tennis Lessons for yourself as well today!